Sharyland Pioneer quarterback Jacob Rosales (8) attempts to avoid the tackle of Mercedes line backer Jay Ayala (32) during a gain of yardage in a District 16-5A Division II game at Richard Thompson stadium on Friday, Oct. 5, 2018, in Mission. Sharyland High and Sharyland Pioneer have met just four times on a football field, but the matchup is on its way to becoming a budding Valley football rivalry. The Rattlers defeated the Diamondbacks 58-6 in 2014, the first year of Sharyland Pioneer’s existence. Since then, Sharyland High and Sharyland Pioneer have alternated victories by an average winning margin of 9.7 points. The annual Sharyland High (4-3, 3-0) and Sharyland Pioneer (4-2, 2-0) football game is affectionately named the Snakeskin Classic. The Rattlers won last year’s meeting by the skin of their teeth, or fangs if you prefer. Then-junior quarterback Edgar Longoria sliced up the Diamondback defense for six rushing touchdowns. Longoria’s sixth touchdown came with nine seconds left in regulation, sealing Sharyland High’s 56-49 win. 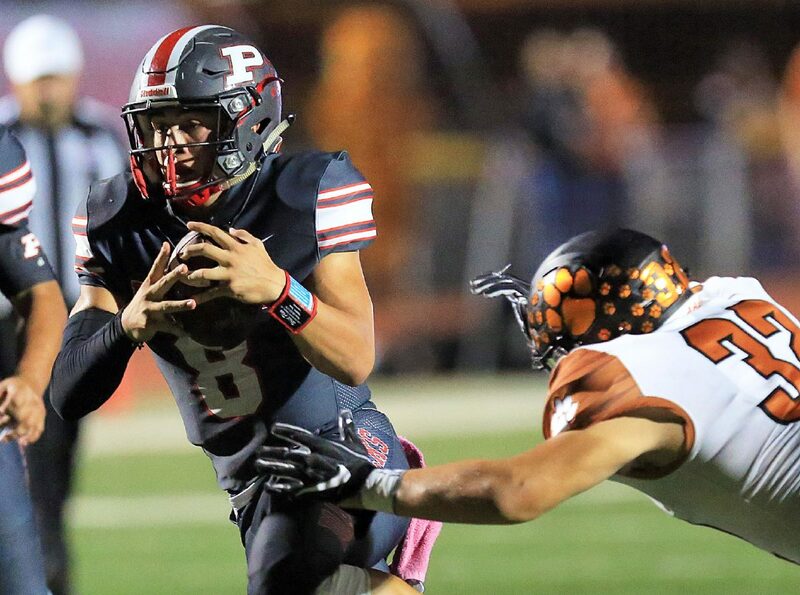 Then-Sharyland Pioneer junior Jacob Rosales helped the Diamondbacks take a 21-7 lead in last year’s game, only to see the Rattlers pull off a fourth-quarter comeback. Sharyland High quarter back Edgar Longoria (4) handsoff the ball to Danny Escalera (30) in a non district game against Brownsville Pace at Richard Thompson Stadium on Friday, Aug. 31, 2018, in Mission. Longoria and Rosales both returned for their senior seasons, but both teams are operating offenses within two-quarterback systems. 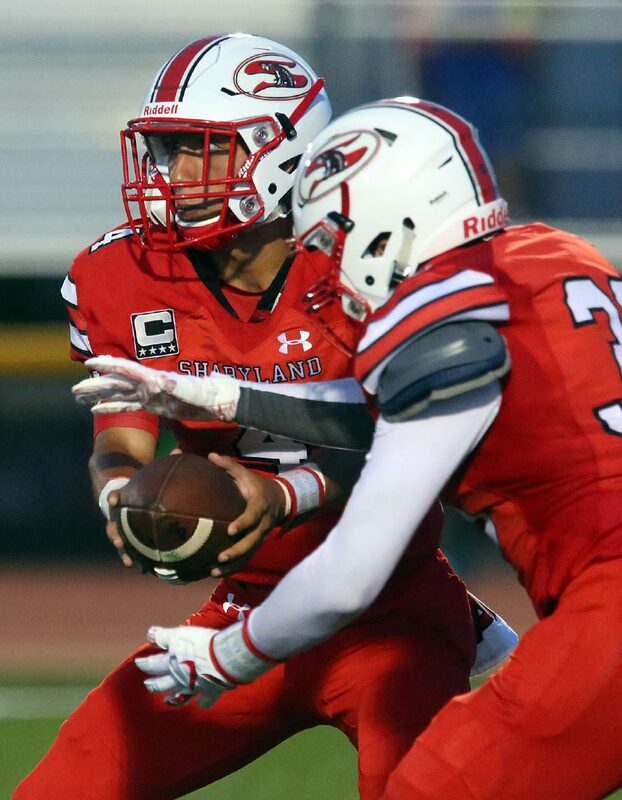 Sophomore Eddie Marburger (748 passing yards, eight touchdown passes and four interceptions) works alongside Rosales at Sharyland Pioneer while Oscar Valdez has taken valuable snaps for Sharyland High. Valdez was a perfect 8 for 8 passing for 180 yards, two touchdown passes and two rushing touchdowns in the Rattlers’ 47-21 triumph over Edcouch-Elsa in Week 7. Sharyland High trailed Edcouch-Elsa 7-3 early in the second quarter, but took a 17-14 lead into the locker room. Wide receiver Gabriel Tamez was Valdez’s favorite target. Tamez’s three catches was tied for the most among Sharyland High receivers on Friday with two of his receptions accounting for both of Valdez’s touchdown passes. Sharyland High and Sharyland Pioneer don’t have the struggling defenses that both teams had in 2017. The Diamondbacks allow 28.0 points per game while the Rattlers are giving up 19.6 points on average. Sharyland High senior linebacker Javo Lopez’s 87 tackles is the fourth-most tackles among Class 5A Division II players in Texas. Sharyland Pioneer reaffirmed its intention to compete for the District 16-5A Division II regular season title last week. The Diamondbacks beat the previously undefeated Valley View Tigers 35-28 in Hidalgo. Known as a pass-happy offense in the program’s short history, Sharyland Pioneer dominated the ground game for 343 yards in Week 7. Sophomore Tristan Castillo, a converted wide receiver, ran the ball 14 times for 108 yards and two scores. Castillo’s performance was the first 100-yard rushing performance of his career. Friday’s winner will have sole possession of first place in District 16-5A Division II. Kickoff is set for 7:30 p.m. at Richard Thompson Stadium in Mission.